Meet your new summer game changer: boozy popsicles! A cross between a cocktail, fruit snack, and healthy dessert, (well, certainly healthier than some!). A Puree of fresh fruit that is mixed with alcohol and frozen into a popsicle; these treats are fast becoming the official dessert of the summer here in Phoenix. Boozy Popsicles come in three flavors, Cucumber Melon, Blueberry Basil and Watermelon & Mint, and are available at Kelly’s At Southbridge, a staple in Old Town Scottsdale’s dining district. Don't live in Phoenix...don't worry I've secured the recipe for Kelly's Cucumber Melon popsicle just for you! I bought a huge box of popsicle sticks last summer - partly for craft projects, but mostly for frozen treats. Love these. Maybe not for the kids, but definitely for me! I love boozy popsicles!! They are so fun! Perfect for the Memorial Day Weekend! How fun is this recipe? So cute. I love popsicles so this is right up my alley. What a refreshing dessert for a hot summer day! Love the presentation in the wine glass. Oh what love the combo of cucumber and melon! Love the combo of cucumber and melon! I just made some boozy popsicles myself today! It's the perfect grownup summer treat. What a great adult treat for the summertime! They all sound fantastic, but the blueberry basil really caught my attention. oh my gosh, haha I totally want to make these! Fun, Fun, Fun. 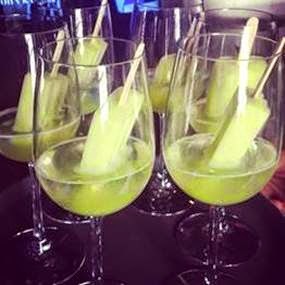 I love this idea of grownup popsicles!